Ask any great athlete what one characteristic they all share and you’ll hear a lot of the same answers. But one general theme will emerge: Regardless of the sport, balance is the common thread. So, it’s time to look at balance basics for golfers. Balance is what allows us as human beings to walk erect and not fall over. Balance is what allows us as humans to increase our speed of movement when participating within a sport. And it’s poor balance that tells our bodies to slow down the moment anything threatens our ability to remain upright. Without great balance, your ability to maximize your club speed at impact diminishes. And without great balance, the chance to place the club face square to your intended target diminishes. Are you “balanced” when you set up to make a swing? And are you “balanced” when you swing? Again, let’s explore some balance basics for golfers. You have five senses. You only use three of them when making a golf swing — your sight, your hearing, and your touch. If we cut one of those senses off, the other two must become more acute. And if we cut off your vision, your touch becomes the only sense your brain and body can use to assist your equilibrium and keep you balanced. Here is a simple exercise you can use to determine if you create a balanced at set-up position. Closing your eyes to force your touch or “feel” to gain valuable data will determine if you are in the correct position to make a swing with every club. How much weight is on your toes versus on your heels? These images from BodiTrak show weight distribution through the stroke — weight forward (top), weight back (center) and slightly forward with equal distribution between heel and toes (bottom). Ideally, for a full swing shot, regardless of the club you have in your hand, proper weight distribution between toes and heels is equal balance. Golf is a sport where you create the action versus reacting to an action. When you need to react, having more weight in the balls of your feet makes sense, so you can be quicker to react. But in golf, having more weight in the balls of your feet can cause adjustments in your swing to counterbalance the disproportionate amount of weight in your feet. These movements can cause poor swing paths, club faces not square to your intended target at impact, but worst of all, deceleration of the club as it makes impact with the ball. 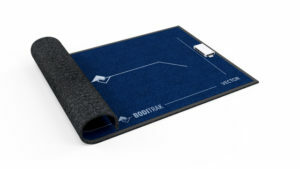 The BodiTrak system uses electronic sensors to measure ground pressure through the golf swing or putting stroke, the foundation of all weight transfer. Be sure that when taking your set-up or address position, you determine and distribute your weight equally between your toes and your heels. Use the instep of each foot as the determining body part to feel the difference. If needed, close your eyes and make the change of balance between toe and heel so your body has a chance to feel the difference, and remember that difference with a feeling you desire to create more often. How much weight is on your right versus your left side? Based on the swing methodology you subscribe to, there are many different opinions as to how much weight should be on either side of your body as you set up. As a rule, too much weight towards one side or the other will create an equal and opposite effect on your swing as you put the club into motion. So, what is the correct weight proportion to each side? Simple — the one that allows you to make a weight transfer that is consistent and efficient. Here’s the math behind this simple philosophy. Ask yourself this question: if the average swing last approximately 1.26 seconds, do you have enough time to make a complete weight transfer from the back side of your swing to the front side of your swing that allows the club to accelerate through the golf ball at impact? If the answer is no, because too much weight remains on the back side of your body when you complete your swing, then you started with too much weight on your front side at set-up. The opposite can be true. Too much weight on the back side of your set-up position can cause an irreversible sway forward and past the golf ball, causing an early release, among other things. Adjust the weight balance of your set-up the same way described earlier, close your eyes and make the adjustment. Doing so allows your brain and body to feel the difference, which will most likely with repetition create a more balanced set-up position you are looking for. Short game shots require more accuracy than distance, making a full weight transfer less vital as the shots and clubs to hit those shots gets shorter. As a rule, “posting up,” or leaning to the front side of your set up can lessen the amount of weight shift, while organically shortening your swing. Setting approximately 60 to 65 percent of your weight into your entire front side, not just the foot, allows for a downward motion of the club, causing the ball to go up at impact. And it also allows you the ability to rotate around the front side of your swing as you swing through the ball and release the club. As with full swing shots, toe-to-heel balance remains in the in-step of your foot. 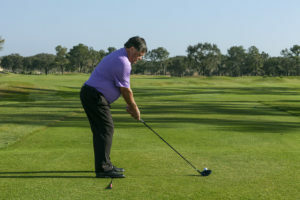 Being too far out to the toe will force your body to bend the front elbow, or “chicken wing” as it’s commonly referred, to bring your body back to balance. The more stable the lower body during a putting stroke, the better. This means that heel-to-toe weight distribution has to be equal regardless of the putting style and putter you choose. You can favor the front side of your stance, as most great putters do. But be sure not to place too much weight to the front side, which produces a bouncing putt from the moment of impact. How Do You Become Better Balanced? There are various “onefoot” drills to help you feel proper balance, including the clock drill in which you move one foot through various clock positions —noon to 6 o'clock with your right foot (shown here) and 6 to 12 with the left foot. Stand on One Foot Drills (see photos) – All the variations described in this drill were provided by fitness experts during rehabilitation sessions I personally experienced or provided my clients during a golf fitness session with my fitness professionals. Place one leg in front of you with your toe pointing toward you. Stand on the one foot for 30 seconds. Repeat with the other leg. This drill helps with ankle stability and allows your body to understand how to balance towards one side or the other, a requirement within a good golf swing. Clock Drill – Standing on one foot, bring other foot forward toward 12 o’clock. Then remaining standing on the same foot, point the other foot at the 12 different clock positions. This drill will not only assist you with balancing a simple movement, it will also start working on the core skeletal/muscular structures that facilitate a great golf swing. Throw the Ball Drill – I’ve featured this drill in previous Golf Tips features. This time, the emphasis is holding a completed finish position that is well balanced. The “wedge under the back foot drill” helps you feel how weight should be distributed at address for the full swing, evenly distributed between heel and toe with slight pressure on the inside of the trailing foot. Wedge under Back Foot Drill (see photo at left) – If your weight transfer at the beginning of your swing sways backward, this drill will sure-up the back foot, keeping the balance point within the instep. 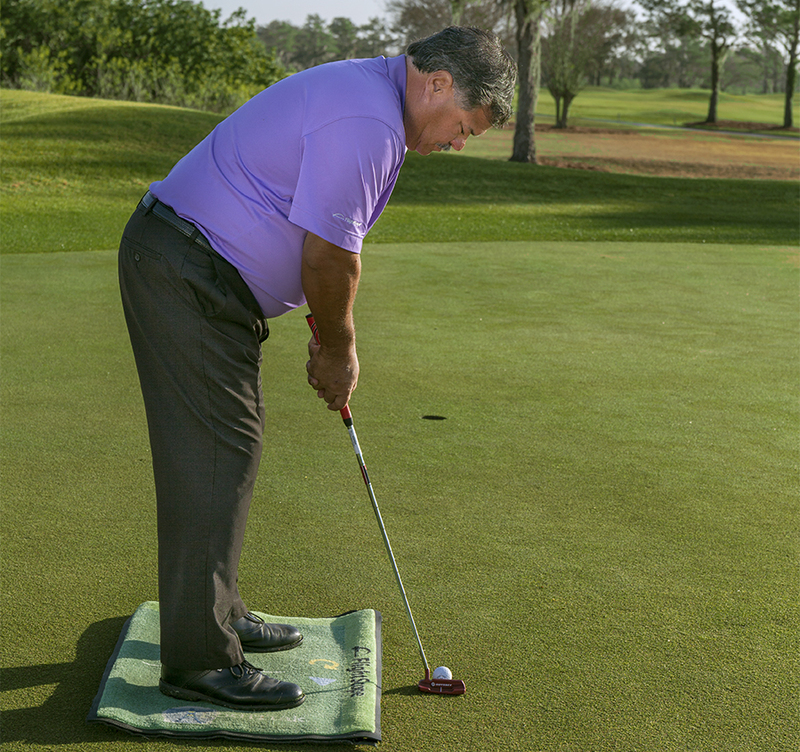 Towel Under Feet Drill – Try making swings while standing on a rolled-up towel. You’ll find if you can’t remain balanced during the swing from heel to toe, your swing will automatically slow down. Only swing within this drill as you can remain balanced. Small swings at first are OK to teach your body how to maintain balance while still delivering a complete weight transfer. “Stork” or Back-Toe Drill (see photos below) — Point your back foot/toe into the ground, forcing weight forward as you chip, creating organic acceleration. Ball Under Back Heel Drill — Same as the Back-Toe Drill but for people who have a hard time balancing. Place a golf ball underneath your back heel to gain the same effect. Putting your trailing foot back and on its toes in a “stork” stance will force you to accelerate through the ball during chips and pitches. Keep your weight forward during a pitch shot’s short backswing to set yourself up for crisp contact. Stay down during follow-through while keeping your weight on your front foot. Balance Related to Eye Position Over the Ball — A couple items are certain with putting balance. If you have too much weight in your toes, it’s likely your eyes will be too far over the ball and line of your putt. The opposite is true; should there be too much weight in your heels, your eyes will most likely be too far inside or away from the ball and your intended target line. Take videos of yourself from down the line in a well-balanced position when attempting a putting stroke to determine if your eyes are in the right place. Every day we balance our lives and our careers. And every day our bodies and brains balance the movements of those activities to allow us to move the most efficient way possible. Why not do the same for your golf swing?